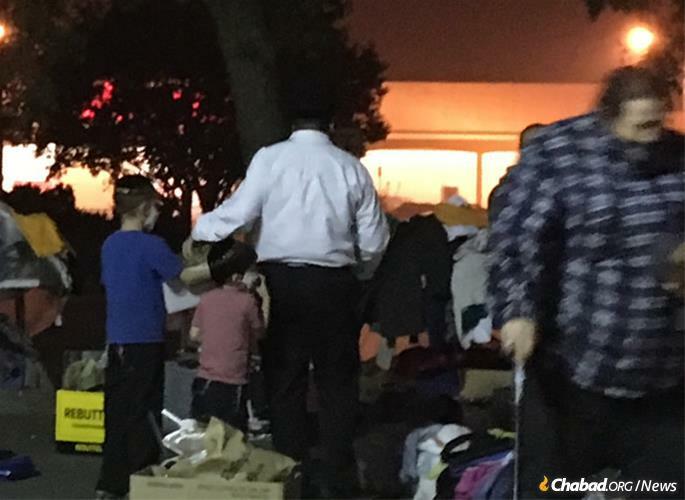 Rabbi Mendy Zwiebel, left, is out on the streets of Chico, Calif., often with his family, helping those who were devastated by fire. Residents are encouraged to wear masks due to pollution from ash that is everywhere, though not everyone has been complying with the suggestion. It seemed like just a regular morning in Paradise. It was Nov. 8, and Randy Stein had an early-morning doctor’s appointment in the nearby town of Oroville, Calif. His wife, Lois, joined him, leaving their home intending to return a few hours later. There was nothing to suggest that they would soon have no home to return to or that Paradise would soon be a wasteland. But things were far from normal that morning. A wildfire was burning near the town of Pulga, and thanks to intense winds, it was spreading quickly. 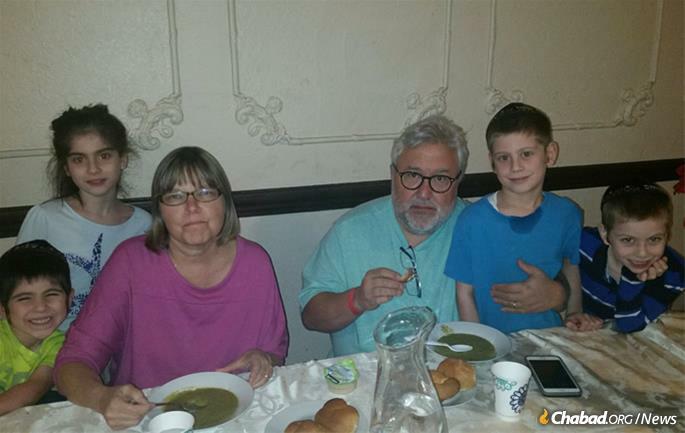 “By the time our appointment was over,” Stein tells Chabad.org, “we couldn’t get back in to Paradise. Everything was blocked. The entire area was black, like night. There were huge black clouds, and the temperature had dropped precipitously. It was like a nuclear winter. You couldn’t see six feet ahead of you. His wife worked part-time in a day care that’s gone, too. Yet the Steins know they were “fortunate.” Even though all they have left are literally the clothes they wore to that doctor appointment, they are alive. The same cannot be said for some of their neighbors. At least five people on their street were killed in the Camp Fire; four of them were in their cars, and one was found right outside of a vehicle. “Paradise was just a small, close-knit community right up the hill from Chico. It was just a lot of retirees, a lot of people who couldn’t make it anywhere else because up until recently, real estate was fairly inexpensive in town,” says Stein. Randy and Lois Stein with the Zweibels. They have lost their home and their business, but not their hope. Since the fire, the Steins—like many other displaced residents who are now dealing with, as Stein said “forced homelessness”—have been moving around. First, they stayed in a hotel in Reno, Nev., and then at a Red Cross shelter in Gridley, Calif., followed by a stay with some family. Soon, another move is anticipated. All of this while trying to keep Lois Stein’s Type 1 diabetes in check—something that wasn’t easy given that she didn’t have her medical supplies with her. Zwiebel clearly recalls the morning of the fire when he looked outside his window and could clearly see something was wrong on the horizon. Though he and his family did not need to evacuate, many others in Chico did. Only in recent days have people started returning home; unless, of course, their home was in Paradise or Magalia. Some of the Zweibel children with a local resident at an aid distribution center. In Magalia, even structures that were undamaged by the fires remain off-limits because of the toxins in the air from the wildfires. Unlike traditional wildfires that burn trees and brush, the smoke from the Camp Fire is filled with all kinds of pollutants as it tore through buildings, gas stations, cars and other industrial material. The air quality in the region is so bad that people are advised to stay indoors and wear masks when they are outside. Schools in Chico are closed until the beginning of December. However, there are many people who are outdoors, living in tents in the Walmart parking lot or other spaces because they have nowhere else to go. Authorities are working to get them into different locations because between the air quality and rains that are expected in the area this week, the parking lots are just not safe. “There just isn’t enough housing,” says Zwiebel, noting that some people are picking up and leaving town, though others are staying because they work in Chico or simply don’t know where else to go. 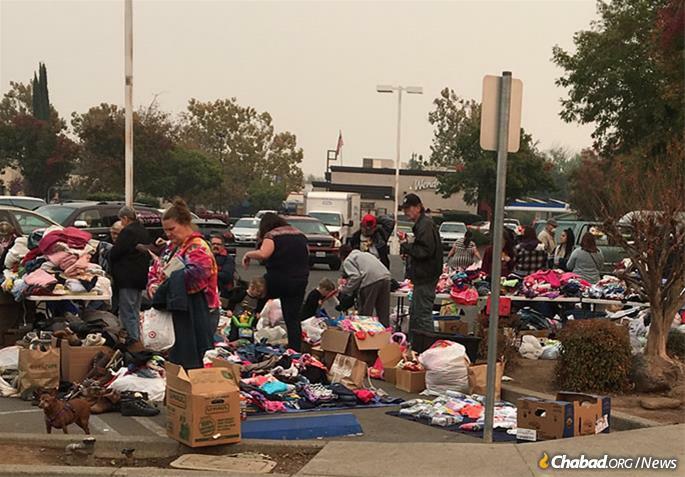 And while people in Chico and surrounding areas in Butte County, Calif., have opened their arms and donated clothes, toiletries and other goods, these items aren’t what people most need right now. Clothing is delivered for the many thousands who have lost everything. 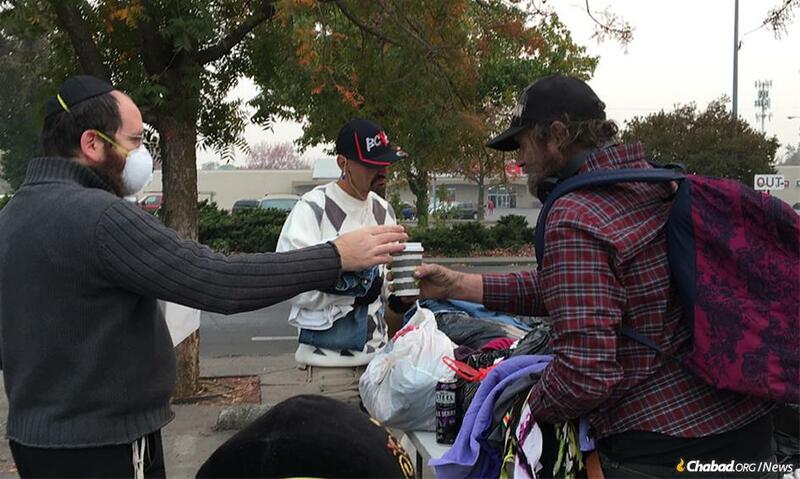 Already, Chabad of Chico has given out nearly $8,000, but Zwiebel says “that’s a drop for what’s really needed. I was just in touch with someone today who doesn’t have insurance and lost everything. They are going to stop by today, and I will [try to] help them out financially. 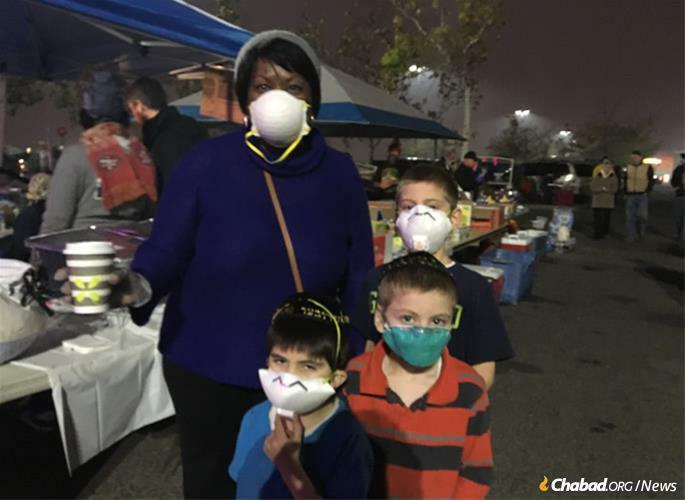 Chabad of Chico has established a fund to help the victims of the Camp Fire. Many locals are living in shelters, and some are camping out in parking lots. Most are only beginning to come to terms with their losses and needs. A local resident stops by the Zwiebel home for a cup of coffee and some conversation. 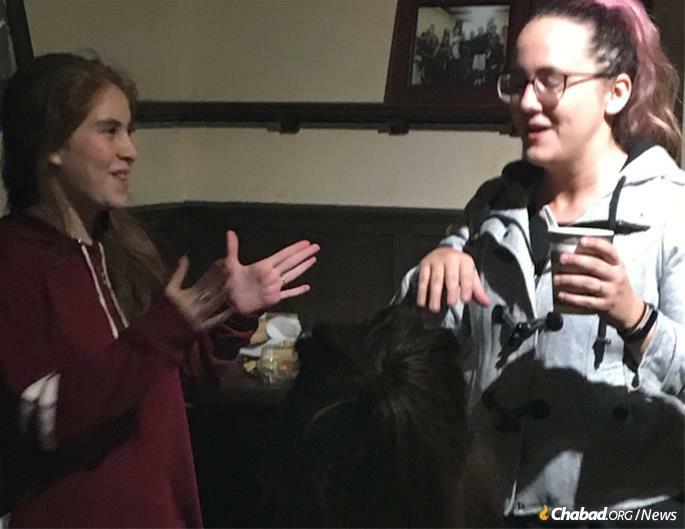 Many come daily, and to the Chabad center, looking for spiritual and material comfort.